Although the LED Downlights can come with a driver, I’ve opted not to use those (and save about ~5$ per light). I will be driving both directly with DC power. This requires me to have a large amount of DC wattage. And since buying power supplies for this is an investment, I’ve decided to test a few “cheap” Chinese models vs Mean Well models to see how they compare and which would be the best investment. I’m splitting some of my ESP8266 posts up to allow for multiple projects I will work on in the future. For the LED lighting at home based on the ESP8266 WiFi PWM LED dimmer this has been renamed to “ESP8266 LED lighting”! As a little hint a new revision of the QuinLED v2.5 will soon be released and posted with an updated layout and a lot larger traces for better power delivery. I wanted to make a little video with an introduction to this “review”. Take a look at it below and watch it to find out what is going on with my ESP8266 projects, the home lighting project and maybe a sneak peek at the latest v2.5 of QuinLED! All of these power supplies need to have the ability to change the voltage slightly up or down to compensate for cable length (because of voltage drop). Especially the for the 34.2v this is critical. For the LED downlights the voltage determines the “warmth” of the light. Lowering voltage makes the light warmer (more red/yellow) and increasing the voltages makes the light cooler (more towards blue or pure white). In the end I will probably determine per string which voltage is needed, I will do some cable length matching to make sure when multiple strings are connected to a single power supply they will have the same color temperature. Because I don’t have the knowledge needed to analyze all components, power input, power output, signal quality, noise generated, etc. I contacted Mux, a fellow member of the tweakers.net forum and known for his work in optimizing computer parts and efficient builds. He’s VERY knowledgeable about power supplies, their build, components and everything about it. Much much more then I am myself. You can find his youtube channel here. He also has a tweakers.net blog with interesting articles. To start off I selected 4 power supplies from China and 4 power supplies from Mean Well (a respected US brand) to compare. Before bringing them to Mux I shot photo’s of all the interiors and the components. This says nothing about how well they function but does give you a decent idea of their layout. I included some more Chinese brands which I had lying around the house just for fun. Most of these power supplies have been sourced from Aliexpress. The older models are from DealExtreme. As you can see, there are lots of different designs. The one’s I purchased for this test are the 24v and 36v (which I can adjust down for the desired 34.2v) versions. The older 12v one’s I included pictures of are mostly 12v. As I mentioned above Mux will be doing video reviews of some of these power supplies to make a comparison about the quality of the Chinese and the Mean Well models. This section of the post will be continuously updated while the videos are released. 2. MeanWell vs Junke teardown! As I stated above, in the end my selection of what to buy in bulk will be a combination of Quality and Cost effectiveness. 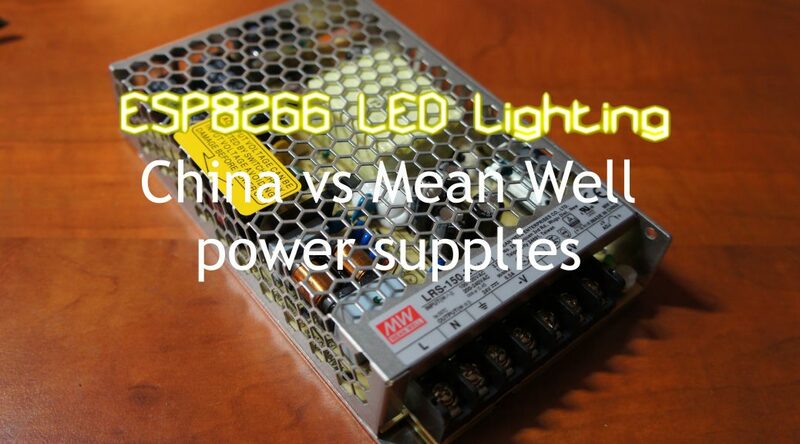 With that comes the question, are Chinese power supplies really cheaper then a well known brand such as Mean well? To try and figure that out, I made some calculations. Let’s take quality out of the equation for a little bit and just focus on initial cost to buy these things. Does buying Chinese versions make sense? Please take a look at the table below. This table reflects all costs associated with buying the 24v power supplies. In the above image you can see a comparison of all the 24v power supplies. The most interesting column is the “Euro per Watt” on the right. This allows you to directly compare (regardless of quality) all the power supplies selected. As you can see, the cheapest in the sheet only costs 0,08 euro per watt while the most expensive costs 0,15 euro per watt. As was kind of expected, the cheapest is a Chinese one and the most expensive is a Mean Well power supply. Looking a bit closer at the Chinese versions there is a wild fluctuation of the prices. The 0,08 euro one is actually kind of out of line with the rest of the Chinese versions which is probably reflected in the quality, but we weren’t looking at that right now. With that said, to get 3500 watt of 24v power (assuming each power supply can deliver 100% of it’s rated output continuously) buying this amount in China would set me back 285,25 euro’s while buying Mean Well power supplies would set me back 390,25 euro’s. A good 100 euro more! But… take a good look at that sheet. Only the Espace one is that cheap, a quick look over the “Euro per Watt” column actually shows that on average the Chinese power supplies are the same price or even more expensive then the Mean Well versions, a big surprise to me! Conclusion: If you only look at price and care about NOTHING else (And blindly believe all specifications), yes, a Chinese power supply can actually be a bit cheaper (It will save you a little bit more then 100 euro’s). But as I said before, price is not the only factor to take into account while looking at buying a power supply. Actual power delivery, stability and quality (is it safe?) are other important factors to take into consideration. While taking quality into account the equation all of a sudden gets much simpler. Suddenly, the dirt cheap 0,08 euro per watt Chinese power supply really isn’t an option anymore. And this raises the price of the Chinese versions to at least 0,11 euro per watt just like the Mean Well options (for high power output) cost. Then taking into account the difference in design quality and component quality which equates into a much longer life span, safer operation and in the end just less worry about it makes the final decision quite easy. If a quality brand Mean Well power supply costs the same as a cheaply manufactured (although not all of them are complete rubbish) Chinese version. Why would you ever opt for the Chinese model? Something funny about this test is that all the Mean Well models reviewed in this test are actually also manufactured in China. So technically, ALL power supplies in this test are made in China. The only real difference is in the design and used components in the actual product. More expensive Mean Well power supplies get manufactured in the US but for these budget models this just isn’t economical anymore. If you actually finished reading the whole article and ended up here, you know what my ending conclusion will be. After doing this comparison, there really is no reason left to buy a Chinese power supply for my setup. Mean Well power supplies are of proven much better quality (see video’s!) and in a cost comparison basically cost the same. Previous PostHome Networking: HDMI extender over EthernetNext PostClean your computer or it might EXPLODE! I do a lot with LED lights as well, but i wonder: Why do you use 24v power supplies (and i assume 24v led strips as well) and why? Is your Quinled design also suited for 24v led strips? I have always used 12v led strips so far. Hi Onok! The main reason I use 24v instead of 12v is because of voltage drop. I will be running 1m to 10m cables in my house to all the LED strips and downlights and the higher the voltage, the less volts I lose during transport. QuinLED itself is fully variable voltage. It will run on anything from 5v to about 36v. Unofficially it can go up to 60v (the max of the MOSFETs) but the voltage converter can’t really handle that for a long time. Power supplies are, though. I’m currently testing some Mean Well power supplies to see how those stack up against Chinese counterparts, but closed “laptop style” I really can’t give you any good advice at this point. FYI, MeanWell is a Taiwanese company, not American. To avoid unequal voltages along a LED strip, you can make the positive and negative connections at opposite ends of the strip. Each segment will then have the same amount of flexPCB in its circuit with the power supply. One option, if you are using metal housings, is to use the housing as the negative/ground conductor. Just make sure that you cut through any surface finish (including the clear anodization on aluminum) at the points of contact, and if you need to jumper across sections of channel. Also, if all you have is 12v strip, you can cut the traces into two segments in the middle and connect them in series. I’m also toying with using cheap buck converter modules to drop from a 24-32v supply to 12v, or 5v, in the case of some NeoPixel strips. Great article, it’s always nice to compare noname power supplies with quality ones. Thanks!